Being a big fan of Minecraft, I couldn’t say I wasn’t the least bit curious of a game also inspired by the game that inspired it. Dwarfs?! is a top-down mining strategy game, of which I don’t believe there are many. You play the Overseer aka God. The point of the game is to let the titular dwarfs do their business and intervene when necessary. While unique and cartoonish (my favorite type of video game artwork), the visuals aren’t too much to talk about here. With most maps being primarily dirt, the same tile is splayed out all over the screen with different mineral types thrown about here and there. 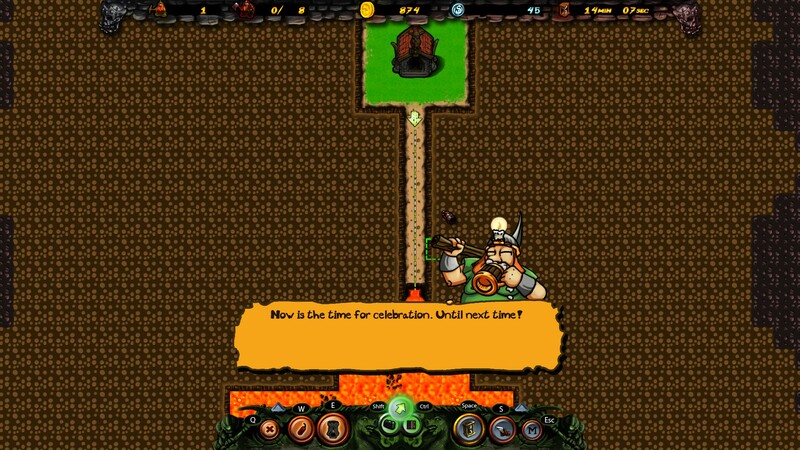 Like most strategy games, there are a multiple unit types: Digger Dwarfs and Warrior Dwarfs. Digger Dwarfs are the focus of the game. 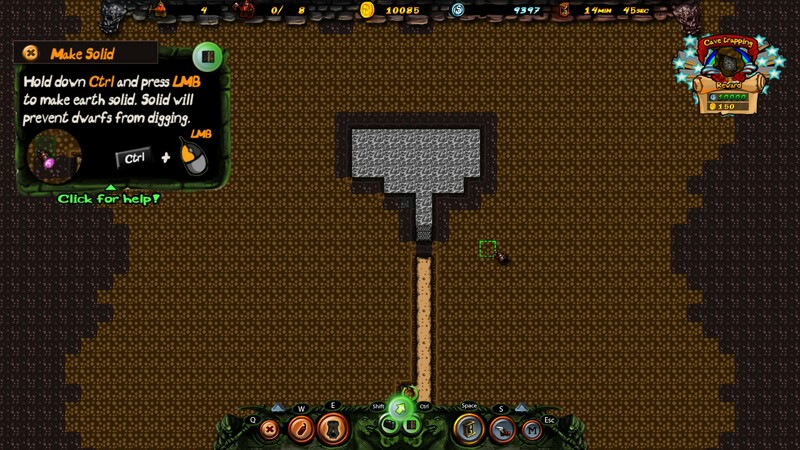 The Diggers spend the game mining through the randomly generated map in search of different minerals to make gold. 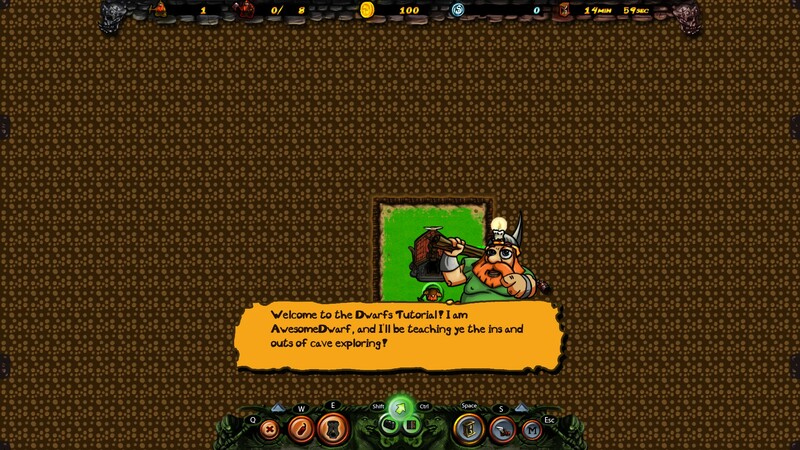 As they dig, various caves are unveiled containing goodies or baddies. 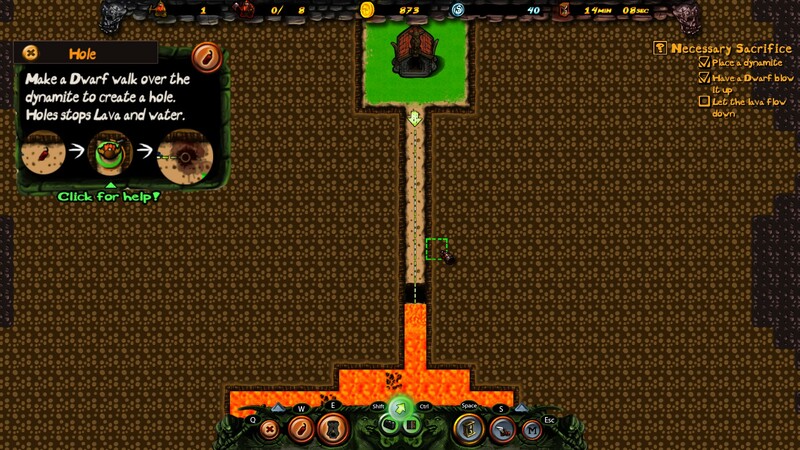 Caves containing natural obstacles such as lava or water must be “trapped”. That’s where you come in. As the Overseer, you must solidify the dirt surrounding said obstacles or risk losing dwarfs. Doing so comes at a price, of course… gold. If you don’t have the cash, bye bye dwarfs. On the other end of the spectrum, you’ve got hidden treasures adding more to your wealth. Aside from trapping obstacles, as the Overseer, you’ve got the ability to create “paths” for dwarfs (digger and warrior alike) to follow. Whenever a dwarf encounters a path, they’ll continue along it, mining anything in their way. 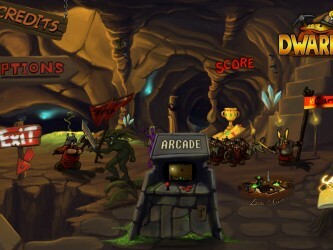 Aside from the natural obstacles, caves may also be harboring enemies. Having a lower HP and being the breadwinners of the game, you’ve gotta protect the Diggers the best you can. That’s where Warrior Dwarfs come in. You can train Warrior Dwarfs to patrol and protect the Diggers. 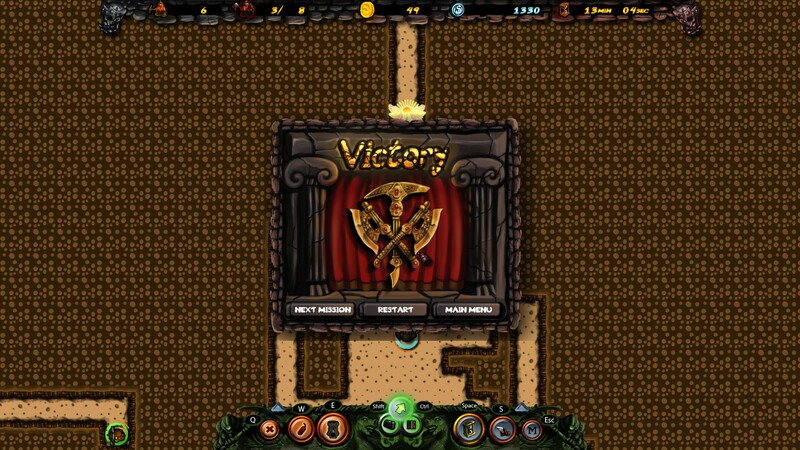 One of the things that I was most impressed by was the sheer number of game modes included in Dwarfs?!. 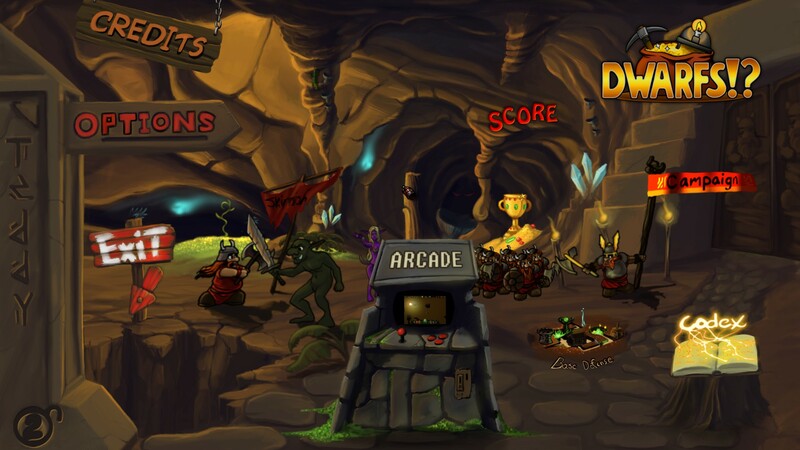 From campaign and arcade mode to base defense and the few other skirmish modes, Dwarfs?! definitely has some replay value. The main gripe I have with the game is the awkwardness of the controls. There were plenty of times when I wanted to move to a different area of the map, but spent nearly 100 gold on an unnecessary, and probably problematic path; sending diggers or warriors toward a section of the map that I wasn’t ready to explore / mine. Just like the visuals, the sound isn’t much to write home about. Background music and sound effects add to the game, but don’t do much standing out. Being more of a simulation / strategy game, there isn’t too much of a story. 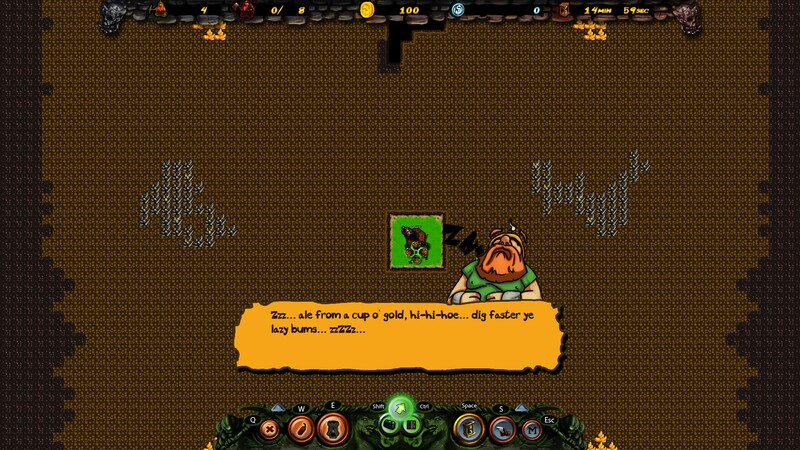 In fact, there may be more story in the tutorial mode when you’re learning your way through the game, led by one of the dwarfs themselves. At $9.99 Dwarfs?! 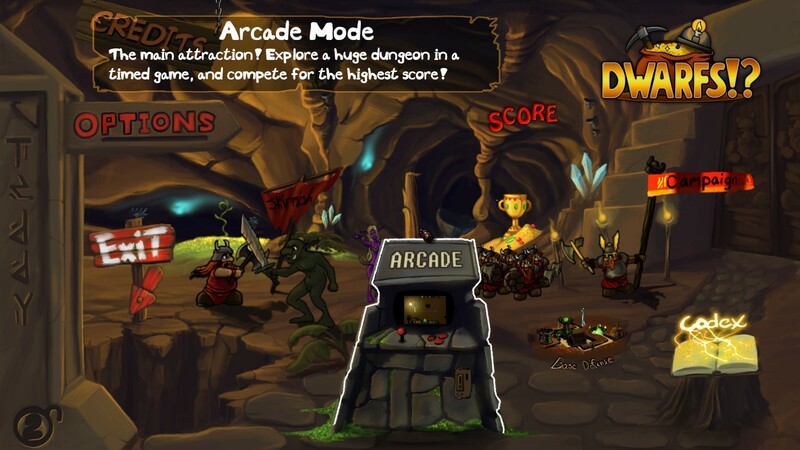 is a fun game with a lot of replay value. It may not be for everyone, but those that enjoy simulation / strategy games may get a kick out of this one. 8.2 / 10: A unique game with a plethora of modes to waste hours of your day.